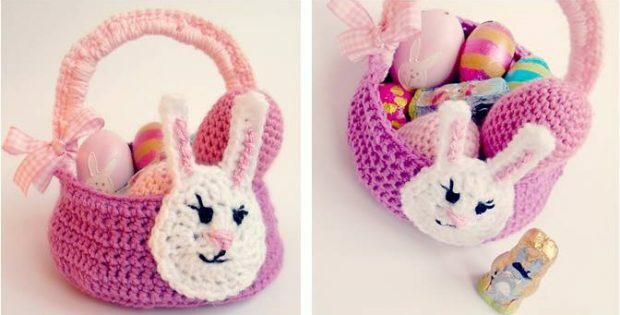 This cute crocheted Easter bunny basket will definitely make any little girl smile. The pink color and ribbon detail make this crocheted piece even more charming. It is so irresistibly cute it will definitely be the star of the neighborhood Easter egg hunt! The beautiful crocheted Easter bunny basket pattern is just the perfect size for your little girl. Intermediate to advanced crocheters will definitely enjoy creating this wonderful crocheted Easter bunny basket. In fact, it is the perfect project for the season! This cute and lovely crocheted Easter bunny basket is an amazing design by Lucia Förthmann. You can access the FREE pattern for this pretty crocheted Easter bunny basket on her website. Finally, to access the FREE pattern for this adorably cute Easter bunny basket, please click on this link: Easter Bunny Basket Pattern. Featured image: Kardiomuffelchen – thank you!